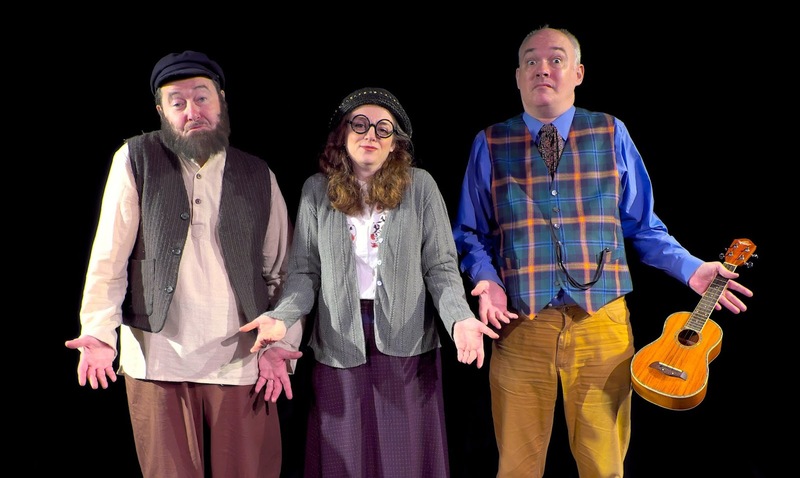 "The Milkman's on His Way"
Yelena Shmulenson, Allen Lewis Rickman, Shane Baker. While specializing in Yiddish characters—he and his wife, Yelena Shmulenson, played the Yiddish-language prologue to the Coen brothers’ movie A Serious Man—he also excels in English-language roles. In fact, he was the funniest thing in Relatively Speaking, the bill of three one-acts by Ethan Coen, Woody Allen, and Elaine May, on Broadway in 2011. If he’d been in all three plays rather than one the show might have lasted longer than it did. 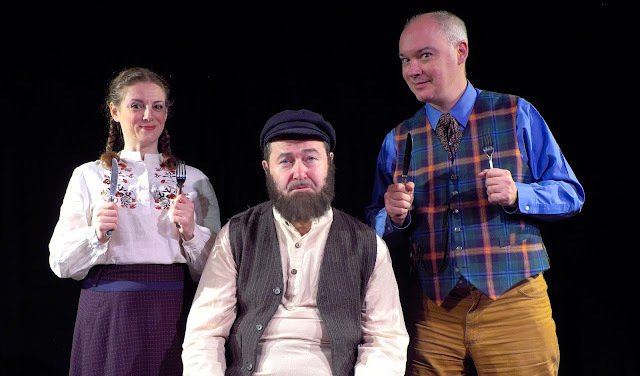 Aleichem (pen name of Solomon Naumovich Rabinovich), of course, wrote the stories about Tevye, the milkman, that inspired Fiddler on the Roof, now being given an excellent production—its first American one in Yiddish—at the Museum of Jewish Heritage. 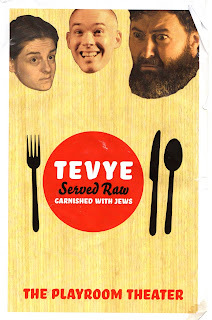 Indeed, as its title discloses, Tevye is at the heart of Tevye Served Raw. And Rickman, as the evening’s Tevye, is a perfect fit for the bearded, Torah-spouting patriarch. This isn’t Fiddler, of course, so Tevye doesn’t sing, but the role’s dramatic power comes across in the three sad and funny selections borrowed from Fiddler’s source material. The other selections, “What, Me Worthy?” “The Yiddish Sisyphus” “Strange Jews on a Train,” and “A Stepmother’s Trash Talk” (along with a lullaby, “Shlof, Mayn Kind,” sung by Shmulenson), provide insightful satirical sketches depicting late 19th-century Russian Jews. 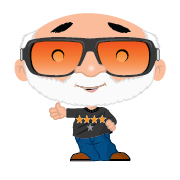 In the interstices, biographical details about the author are provided. Baker and Rickman’s translations are ripe and colloquial, sounding almost as natural as Aleichem’s Yiddish. Shane Baker, Allen Lewis Rickman, Yelena Shmulenson. 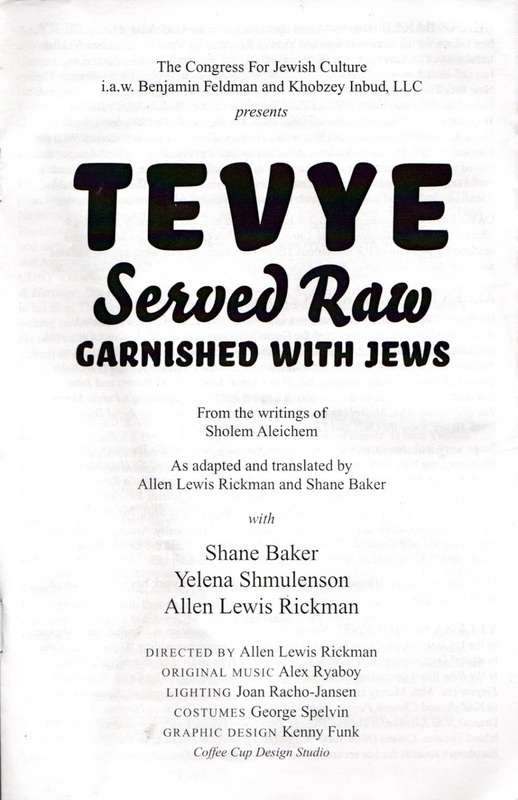 Some selections are entirely in Yiddish, with English titles projected on an upstage screen (where period photos are also shown), and some include simultaneous translation. 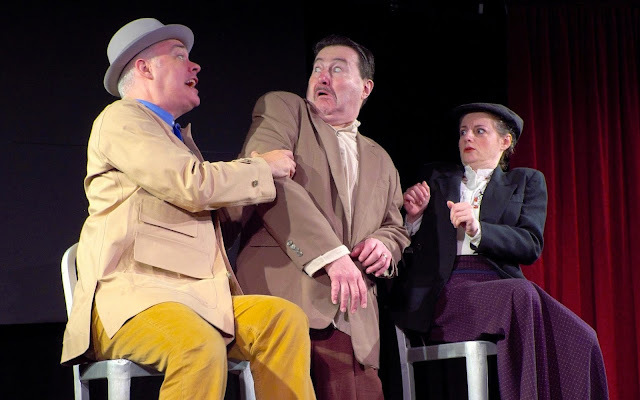 In “Strange Jews on a Train,” for example, a female passenger pesters the man next to her for gossip about a wealthy citizen in his home town. Rickman stands between them and, shifting positions, rapidly translates each’s words and gestures for our benefit. It’s a masterful display of timing and expressiveness. Produced in minimalist fashion with no set to speak of, with fundamental lighting by Joan Racho-Jansen and a few costume basics by George Spelvin (wink, wink), the show is the type that can travel anywhere without a fuss. Its principal drawback is that several selections tend to go on too long, like shaggy dog stories, but fizzle for lack of sufficiently strong payoffs. 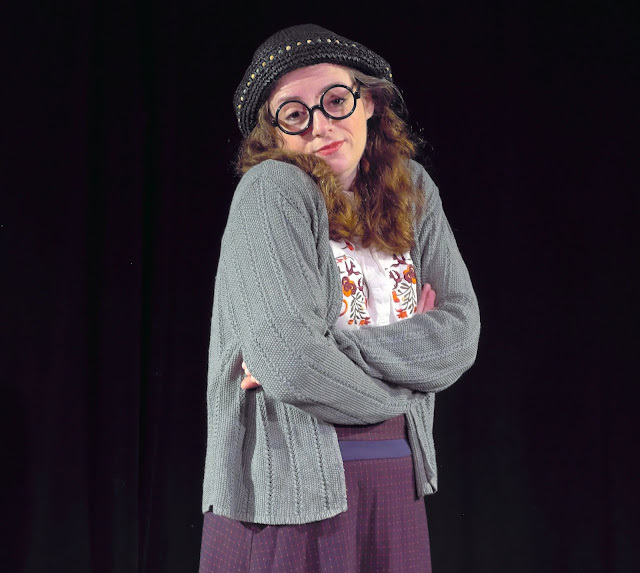 One such example is “A Stepmother’s Trash Talk,” in which Shmulenson and Baker read off the extensive litany of Yiddish insults (like schlemiel) that Aleichem’s stepmother allegedly said and that he secretly transcribed in alphabetical order. As Rickman instantly translates, they go through the entire glossary. A tour de force, perhaps, but decidedly anticlimactic. Allen Lewis Rickman, Yelena Shmulenson, Shane Baker. Of enormous help is the cast’s sheer delight in speaking Yiddish. You can just feel the pleasure they take in biting into the words and chewing all of Sholem Aleichem’s language for every flavor it contains. It’s almost as if bagels, lox, kugel, brisket, matzoh ball soup, challah, and latkes had been turned into language. 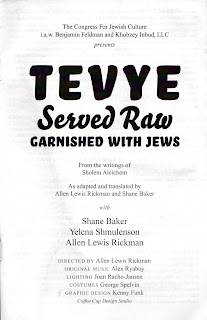 Even with its title, Tevye Served Raw offers a hearty Jewish meal.